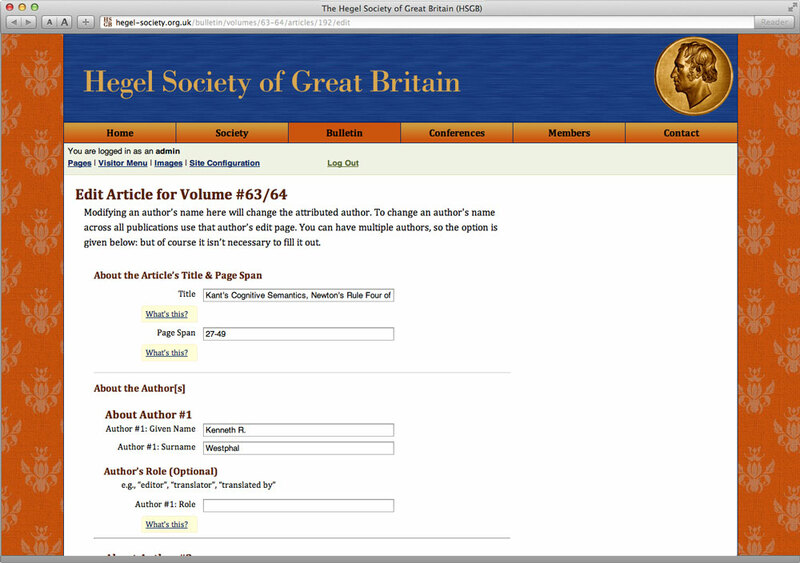 The Hegel Society of Great Britain issues academic journals & conferences on subjects related to the nineteenth-century philosopher. 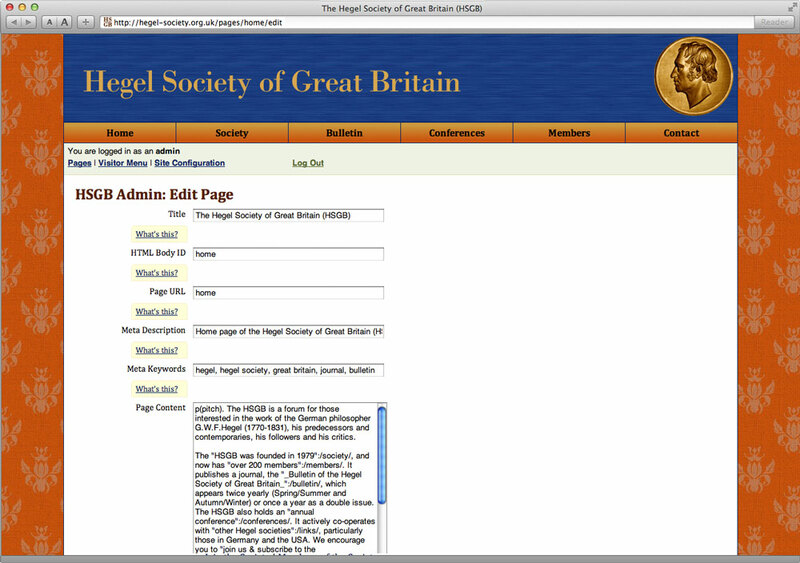 The HSGB’s previous website was edited by hand: minimal updates were infrequent, difficult & prone to error. In addition, the Society wanted to keep better, more up-to-date information on their membership, including their subscriptions. As with any organisation with an elected governing body, there’s always a risk that the exiting officer forgets to supply important materials. Provide them with an online gateway to collect membership dues. 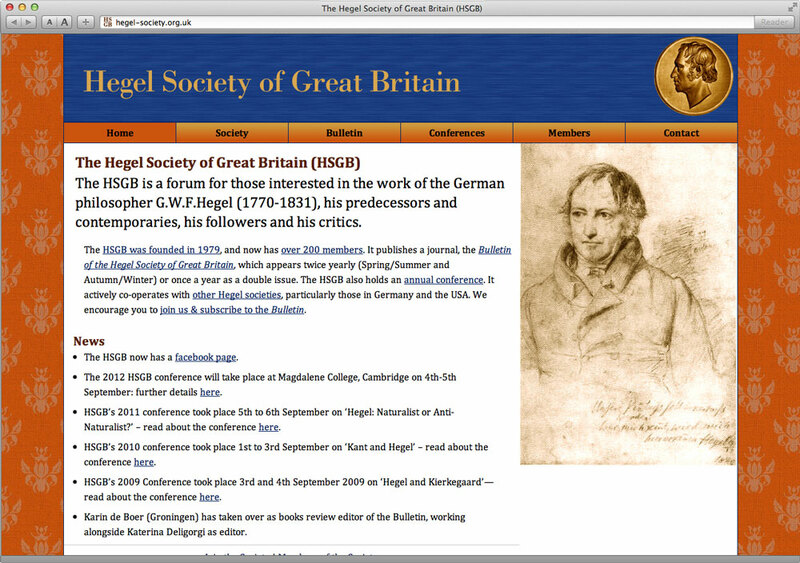 The only image on the HSGB’s old website was of an engraving of a medallion with Hegel’s portrait inscribed on it. This provided some level of continuity with the old site, whilst providing us with a basis upon which to build the site’s new look: give it the elegance of an early nineteenth-century room to emphasis the Society’s historical roots. ardes supplied the HSGB with our bespoke simple CMS (sCMS), which makes the editing of content very easy: without any knowledge of HTML, the site’s admins can concentrate upon what they want to say & know that it will render appropriately in all browsers. As you can see in this image showing the home page being edited, the admins also have full access to all sorts of search-engine-friendly metadata, along with extensive, inline help. And that inline help provides assistance precisely where the site’s admins need it. A common feature of standard website content is that it’s created over time: and accordingly, the method of structuring similar data varies over time. This makes its appearance inconsistent, but more importantly it’s more difficult to manage inconsistent data. Accordingly, specialised data for the website—conference data & the contents of the Society’s journals— are controlled a little more strictly than standard data, to achieve data consistency. An extreme example of data inconsistency—and the variation of data quality when inputted by multiple people over several years—would be the Society’s membership list. We were able to ascertain that the HSGB was missing data on several members & that furthermore, several memberships were in arrears. Providing a manageable system proved to be a lengthy process: not only did the HSGB require a way to manage their members, ardes provided them with an entire subsystem that alerted them to the varying problems associated with their imported data. Furthermore, the admins can now export all membership data so they can analyse it as they need. 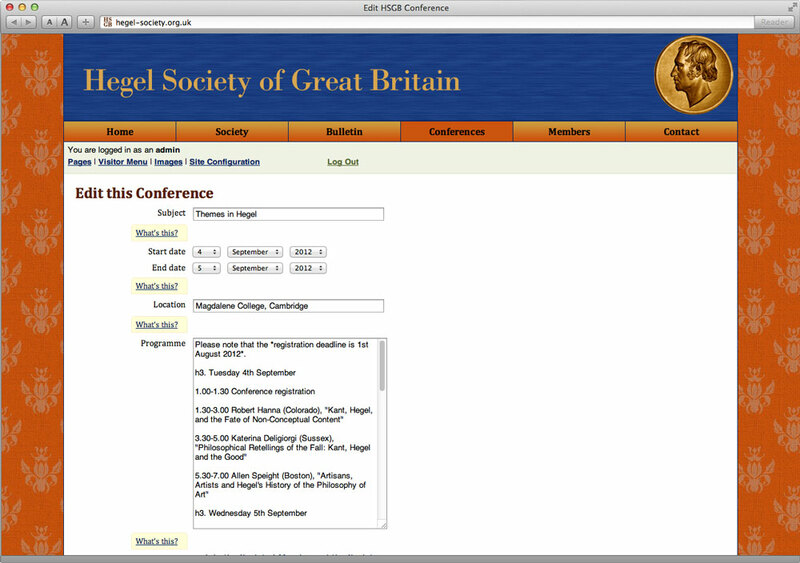 Finally, according to their wishes, we linked the new HSGB website to an external pay gateway to collect membership dues. Accordingly, the Society now can accept subscriptions online, whilst leaving any security liabilities with the third party. No website should be made just for today: if developed properly, its owner will find it easier to redevelop it in the future, whether by extracting data in a meaningful fashion or changing its look with a few keystrokes. By ensuring that the site is easy to manage & that their important data is kept consistent throughout, ardes has given the Hegel Society a firm basis upon which to solidify their position & extend their organisation into the foreseeable future.